How can a devastating disease on THE most popular landscape shrub be a non issue? Rose Rosette Disease is a new virus (Discovered in 2011) that is vectored by a crawling mite (called an eriophyid mite) that is blown in the wind from rose to rose regardless of its cultivar or disease resistance. In addition to being spread by wind it can be also spread by the grafting process at the propagating nursery, and new evidence shows as well as root to root grafts exchange in the landscape bed of roses. Landscape Roses have been a wonderful introduction to landscapes we have used them on the harshest of sites in the landscape and we have used them as sweeps of electric color and form from pinks, reds, doubles etc. 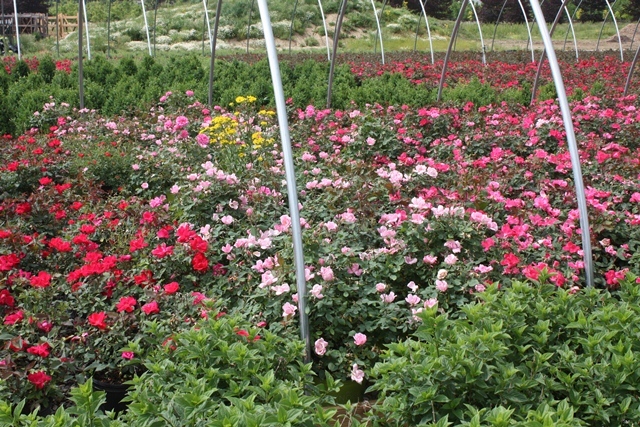 Landscape Roses did not cause the disease but will be most significantly impacted due to how we use them in the landscape in close sweeps and groupings of color. Here we have as an industry a new potentially devastating disease with no true control that could very well make the use of landscape roses obsolete until we find a resistant cultivars and no one is throwing up a red flag? How do we get the word out that landscape roses are not the perfect plant and that if we keep using them in the same manner and rate that we have been, we could have an epidemic on our hands. Could it be ‘The Emerald Ash Borer’ of the landscape rose? I sure hope not. Time to make the public aware of the issue and quite hiding the problem. Here is some of the steps that are being recommended. Pathogen Free Rose Stock: According to this article we can start by making sure that propagators are using virus indexed roses, much like hostas and other plants are now. Multiflora rose (the invasive weed found in woodlands) is the disease’s Pathogen Source and should be removed from any neighboring plantings. Design:Begin Spacing Roses farther apart and away from wild invasive Multiflora Rose- and farther apart for the mites to crawl. REMOVAL- you must remove any infected plant immediately including as many roots as you find. Bagging and removal and not into a compost pile, and making sure that your pruners are sterilized between plants as well as trying to isolate any droppings off the infected plants when you remove. 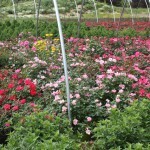 DO NOT TRANSPORT ROSE REMOVALS TO DUMP SITES ESPECIALLY AT THE NURSERY!